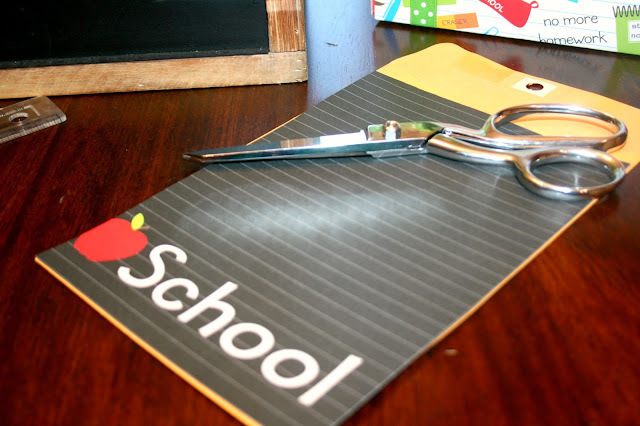 I know it's still summer time and the last thing we want to stress over is back-to-school. But, I like to prepare and be organized for the year ahead. 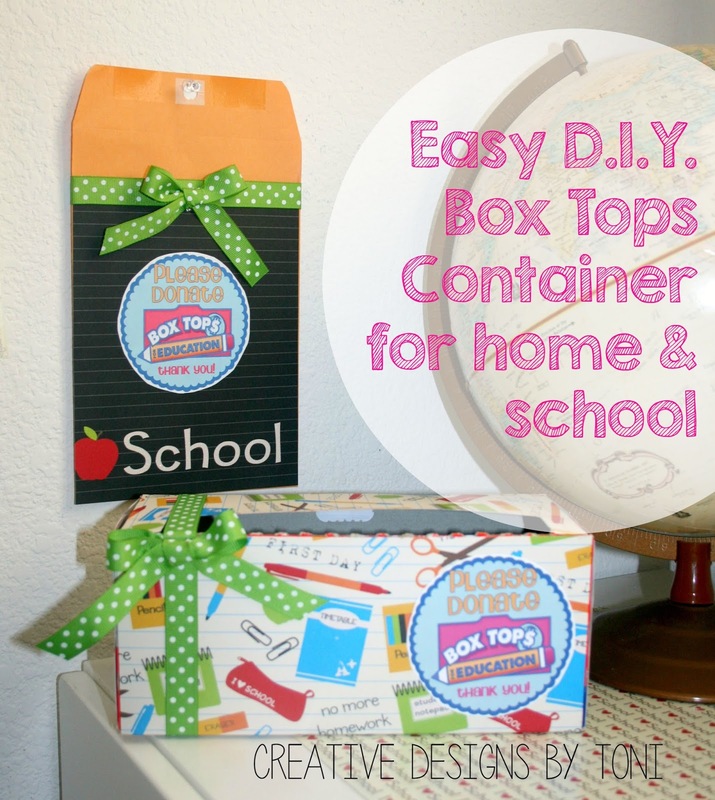 That is why this Easy DIY Box Top Container is perfect! It's simple to create in just a few easy steps, plus you can use all year long. 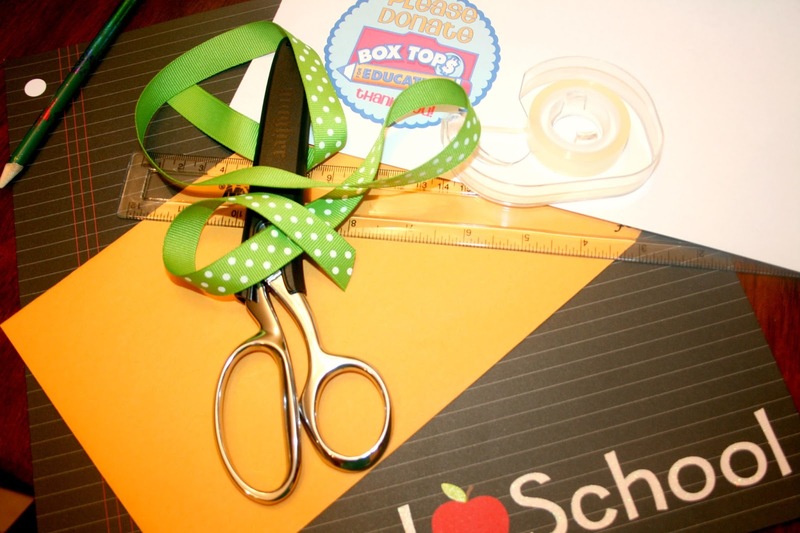 Being a part of our school's PTO, Parent, Teacher Organization, Box Tops play an important role in our school's funding. 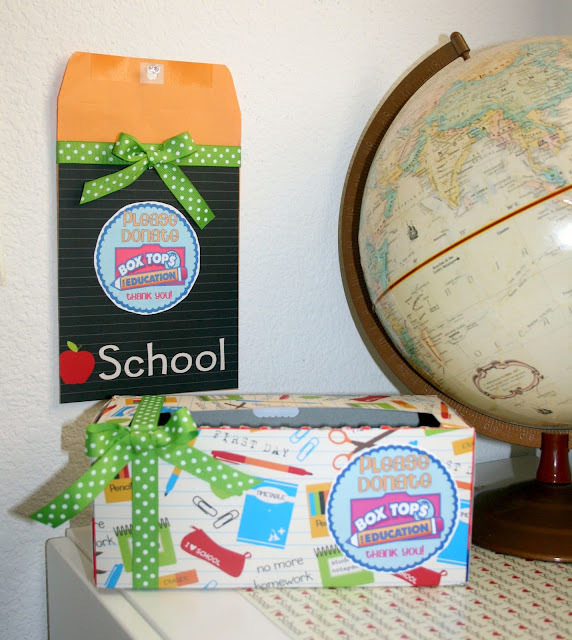 To help bring more awareness of our school's Box Tops For Education program, I also created a simple way to collect Box Top's at school. To prepare for these simple collection containers, I headed to our local Kroger Marketplace and picked up a box of Hefty Trash Bags. Hefty are the only trash bags that supports Box Tops for Education and right now specially marked boxes of Hefty Trash Bags are offering 4, yes FOUR, Box Tops for a limited time. 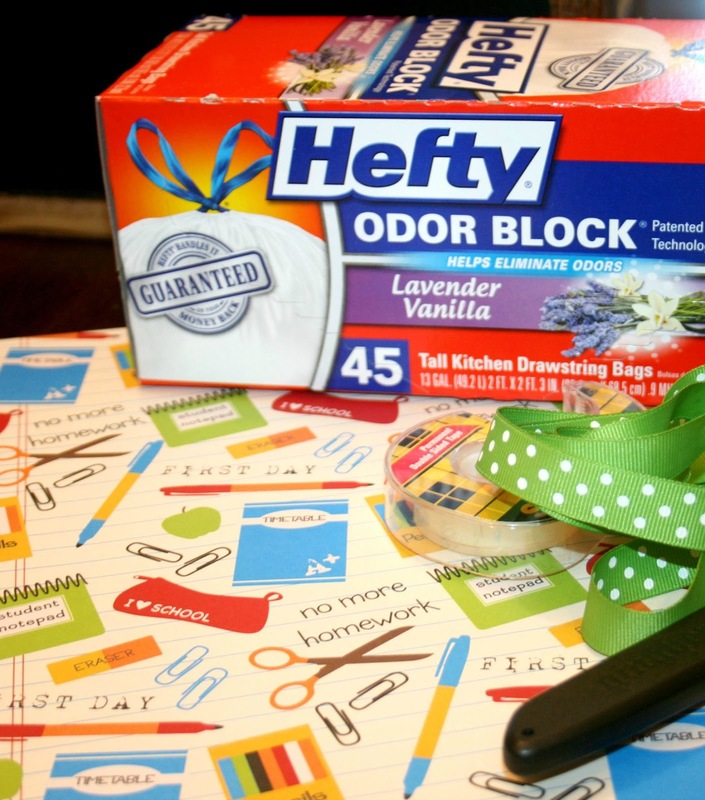 The Hefty brand has helped raise over $3 million in contributions to schools by partnering with Box Tops for Education. 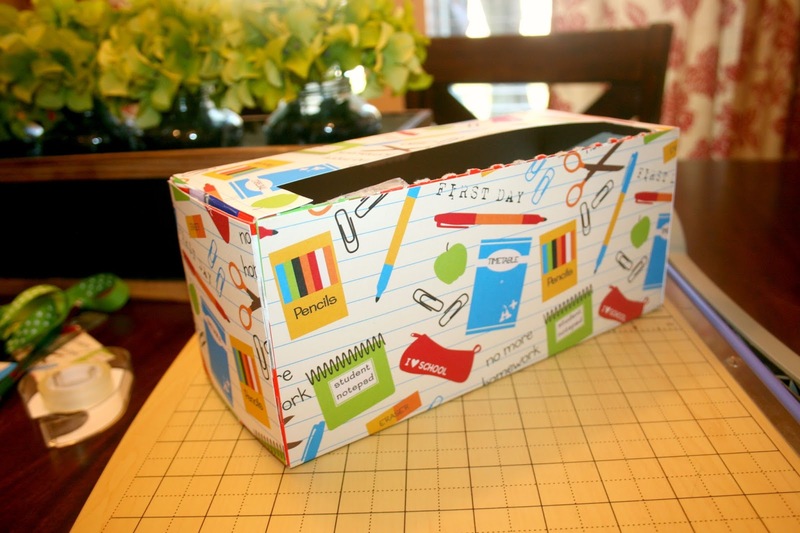 Plus, the boxes are perfect to complete our DIY project. Do you save Box Tops for your school? As the Vice President of our elementary school's PTO program, I work closely with our school's Box Tops for Education Coordinator. 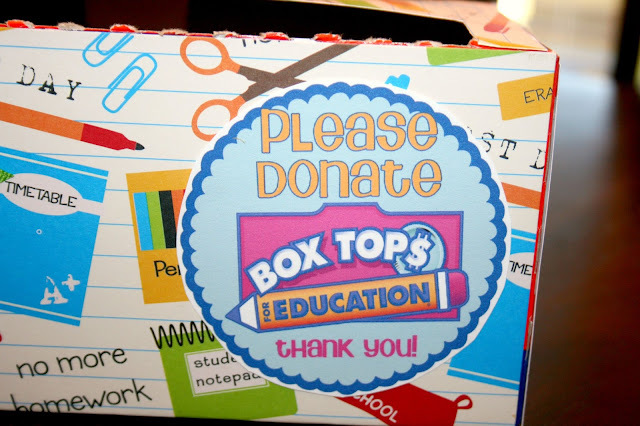 Last school year, we helped raised over $850 towards new books for our school's library just by collecting Box Tops. Box Tops are fairly new to our school and hoping next year we can have an even bigger reward. 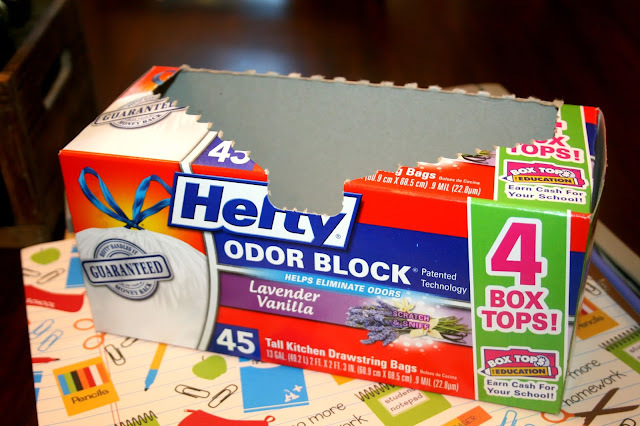 One Hefty Trash Bags Box, featuring 4 Box Tops, to save for your school. 1. Open box along perforated edging and remove trash bags. 2. 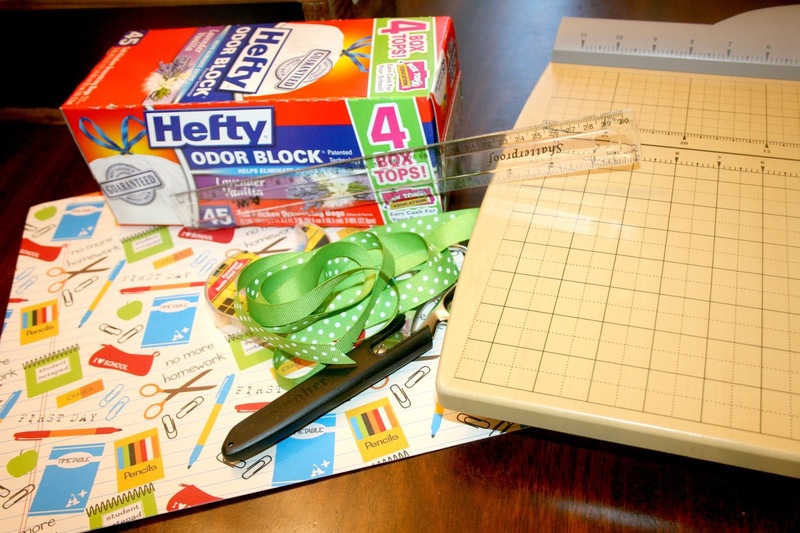 Measure box with ruler and cut paper to fit the width of the box. 3. 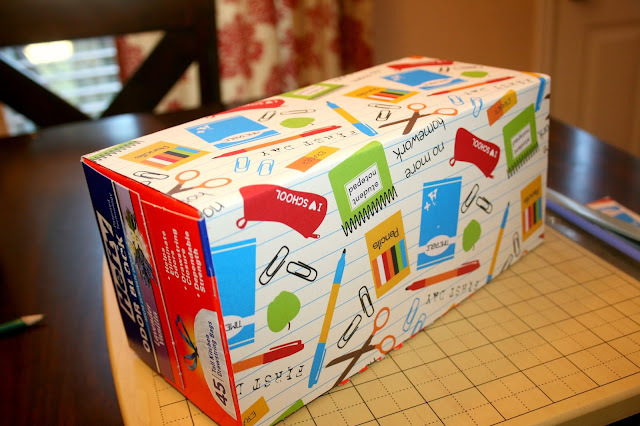 Place double sided tape along the edges of the box and wrap paper around. Create creases along the edges. 4. Our paper didn't fit all the way around, so we had to cut about an 1 inch of a strip from the 2nd sheet of paper. Tape and apply to box all around on 3 sides leaving the top, with opening, clear. 5. To cut the top, we measured all sides and cut a strip to fit the top area. Using a ruler and scissors we cut out a strip about 1 inch in to create our opening for the Box Tops. 6. Apply double sided tape to the box and apply to top. 7. Apply ribbon. 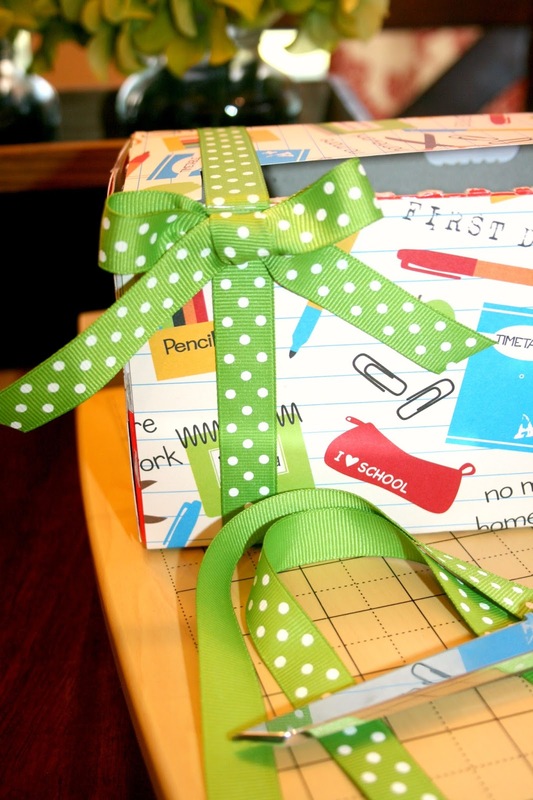 We wrapped the ribbon around one side of the box and attached a bow. We used a permanent double sided tape to hold. But, you can use glue or a glue gun if desired. 8. We searched the internet for a quick label to apply to our front. We simply downloaded it, printed it out, and attached to the front of our box. 9. All done! Place on your counter, desk, or where ever you would like as a reminder to save those boxes tops. 1. 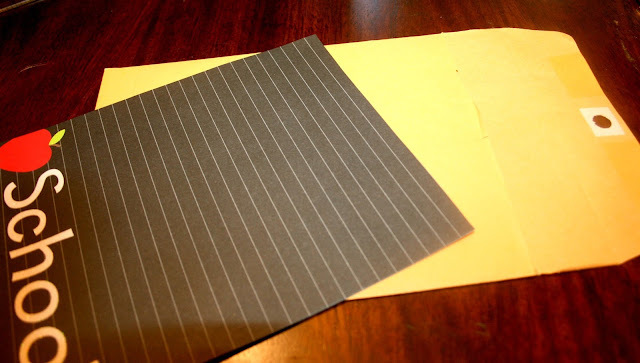 Cut down each side of the mailing envelope about 1 inch or just below the clasp and cut across to remove the upper section. 2. 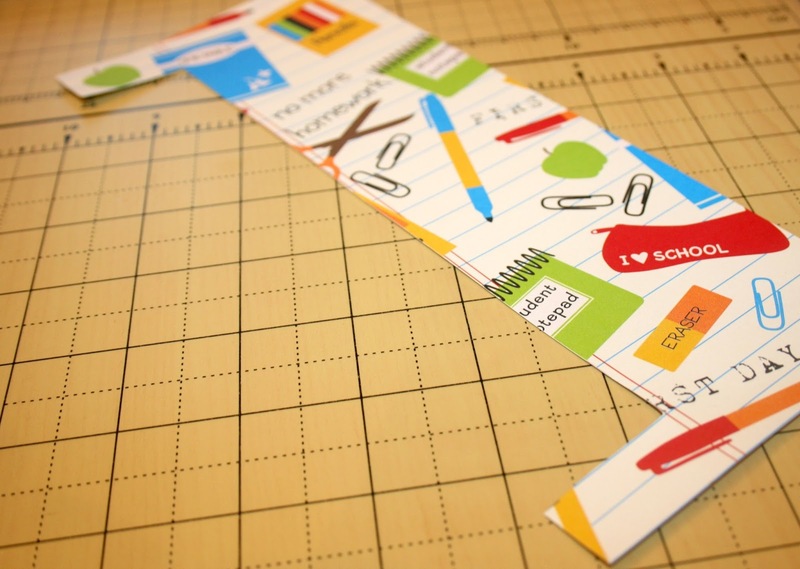 Measure and cut the scrapbook paper to fit the back side of the envelope, the pocket area only. 3. Attach with double sided tape. Make sure you are using permanent tape. 4. 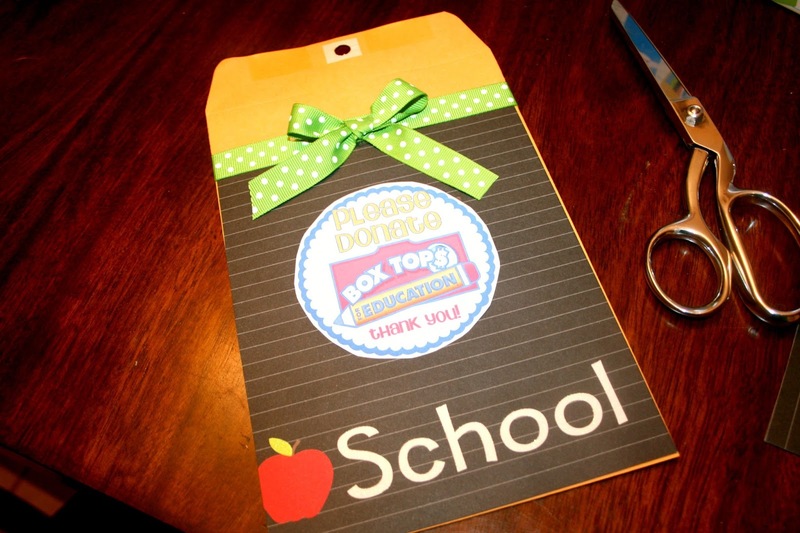 Attach ribbon across the top edging of the pocket, box, and label. 5. 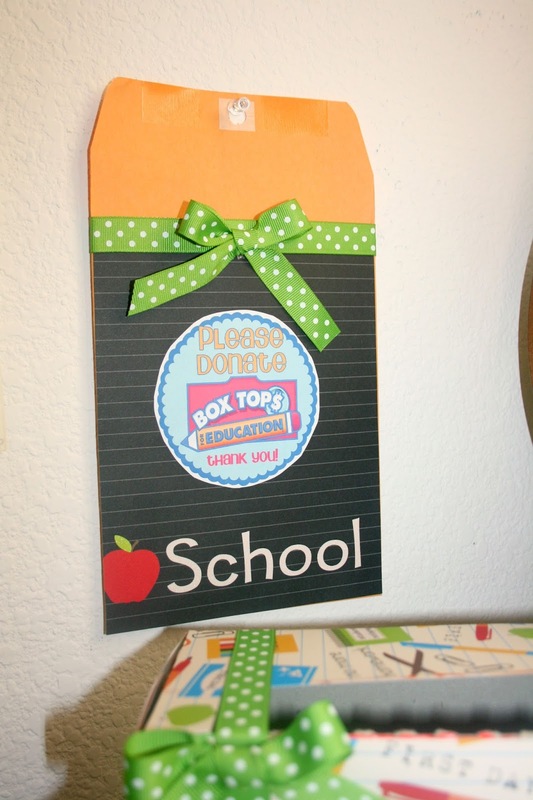 Hang on wall, bulletin board, or anywhere for students to drop off Box Tops for Education. We are hanging ours on our PTO bulletin board in the front of the school by the front office. That way parents, students, and visitors will be able to drop in Box Tops whenever they can. Don't forget to stock up on Hefty Trash Bags to earn more Box Tops for your school. 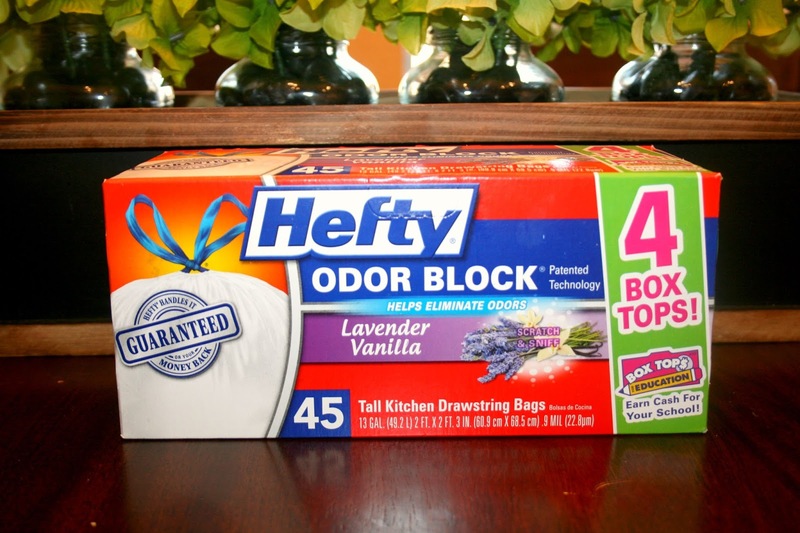 Visit Hefty on Twitter, Facebook, and Instagram. What is your favorite way to store your Box Tops through out the school year? 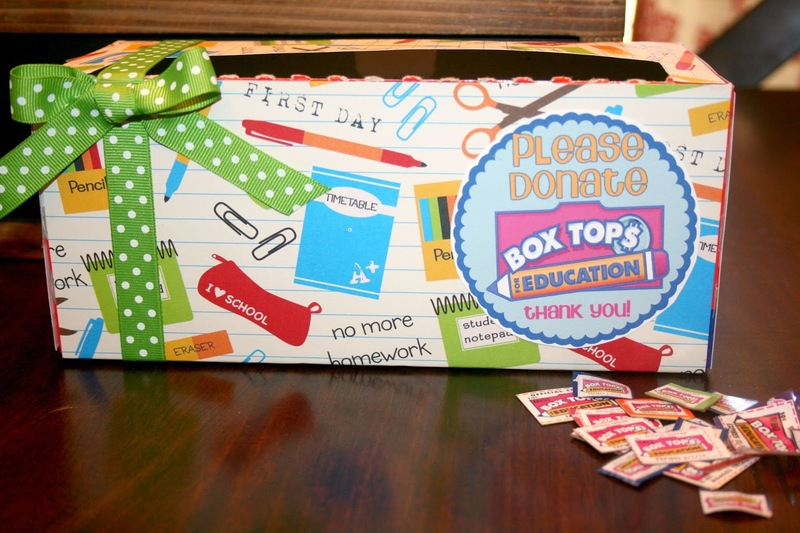 What a super cute idea...I love Box Tops!